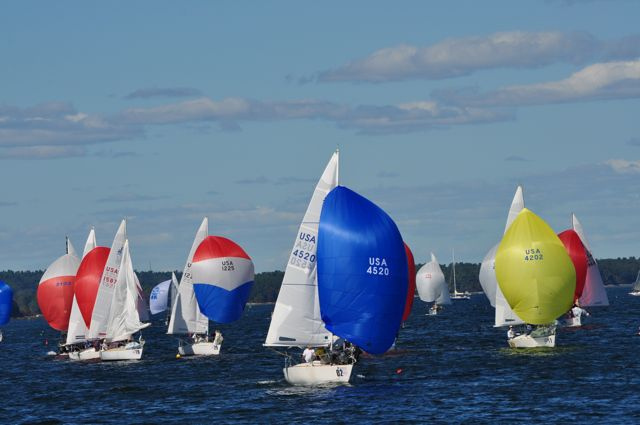 Home » News & Results » Downeast Regatta a Huge Success! 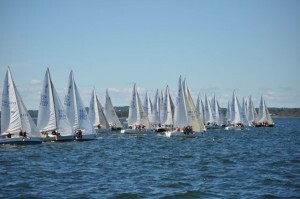 Downeast Regatta a Huge Success! One word to describe the weekend EPIC! 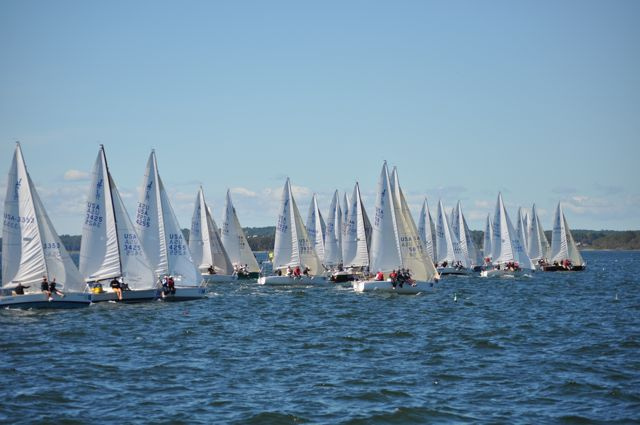 In all 42 boats made it to the starting line during the 25th Anniversary Downeast Regatta in Falmouth Maine hosted by Portland Yacht Club and J24 Fleet 43. Two thirds of the fleet was from out of the State of Maine as far away as Florida, Wisconsin, Maryland, New Jersey, and Nova Scotia Canada. Conditions were excellent given that there was a full moon and left over surge from Katia creating a decent current around and through the islands of Casco Bay. On Saturday the fleet sailed in a north easterly breeze of about 8 to 12 knots with decent 10 to 15 degree shifts and even current over the course. It was difficult to pick which side of the course would pay out, when as both sides seemed to work a different times. Bad Apple skippered by Bruce Morse from Falmouth, Maine picked the right side at the correct time in race two to take the gun in a great race. However Bill Fastiggi, from Burlington VT, skippering USA 5357 Beauty picked all the correct sides all day and finished with two firsts and a second to lead day one. On Sunday the competitors were met with flat water and no wind around 9am on the waterfront. However by 11am the southwesterly prevailing wind filled to 10 to 12 knots and started to build to 15knots by the end of the day. Again strong currents were a factor and played into a prevailing right course side favor in both in-coming and out-going tide, which perplexed even some of the locals. Tony Parker sailing USA 58 Bangor Packet, currently hailing from Washington D.C. won the day with two firsts and a third. Tony is a “honorary” Maine local having started his J24 career way back in the late seventies and early eighties and has won the State of Maine Championship on a couple of occasions. Overall, consistency on both days paid as USA 2785 AL, skippered by Carter White and crewed by owner Mark Klein, Tom Hall, Scott Thomas and Molly White won the regatta and the State of Maine Championship for best Maine boat. They never finished worst than sixth and averaged 3 points to win the event by a narrow margin (3 points) over Bangor Packet. Rounding out the top five were Beauty placing third, Dogfish skippered by Bob Kinsman from Newport RI placing fourth and Bubbles skippered by Taylor Neff from Wayzata Yacht Club in Wisconsin placing fifth. There was a fleet award presented to the top J24 Fleet from outside of the local Fleet 43. Calculated using the scores of the top three boats from each fleet the Fleet award the prizes went to Fleet 50 in Newport Rhode Island. The top three boats that helped them win were Dogfish, On the Beach skippered by Lee Buress and Tasmanian Devil skippered by Steve Wood.